My Facebook friend, Miriam Santiago, was a guest on one of my segments in the past and recently sent me this recipe for a Puerto Rican Jibarito sandwich. The flavors are incredible and with the fried plantains and garlic butter spread, the sandwich makes a tasty presentation. Wayne swaps bread for plantains to make a Puerto Rican Jibarito sandwich. Season both sides of the chicken with 1 1/2 teaspoon of garlic powder, black pepper and Adobo powder. Place chicken in a sealable bag and bathe with a 1/3 cup of olive oil. Let the flavors marry for about 1/2 hour. Preheat the oven to 300 degrees F and then bake the chicken, covered, until done, about 45 minutes. Remove from oven, let the chicken rest for 10 minutes and then cut into slices. *One pound of chicken will make two generous sized sandwiches. You can certainly use this amount of chicken for more than 2 sandwiches if you have guests with lighter appetites. Heat 2 cups vegetable oil in a skillet until hot, 375 degrees F.
Peel the plantains and cut each in half. Then, cut each half lengthwise, to yield 8 pieces. If you want a large sandwich, then just cut the large pieces lengthwise, yielding 4 pieces. Fry the plantains for about 3 or 4 minutes or until they float. Remove from hot oil and drain on paper towels. Flatten the plantains with a heavy pan by pressing down on each one of them. Return the flatten Plantains the hot oil and re-fry for another 3 or 4 minutes or until golden brown. Remove from the hot oil and drain on paper towels. Set them aside. 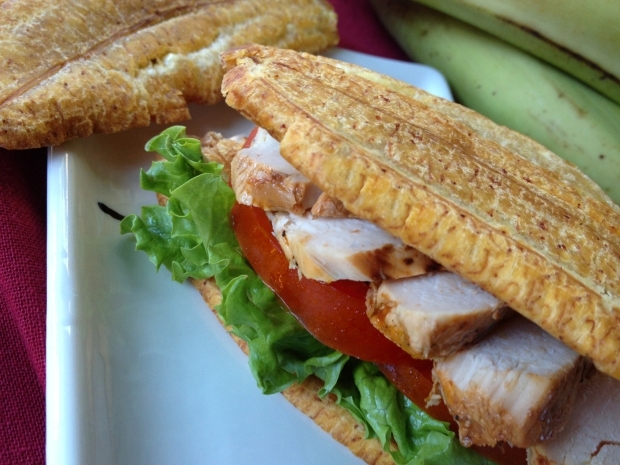 Start to build your sandwich – spread mayonnaise on the inside of each of two plantain slices. Start layering with the sliced chicken, cheese, romaine lettuce, and sliced tomatoes. Top the sandwich with the other plantain slice. Spread the butter-garlic mix on the outside of the sandwich. Stick a toothpick with pimiento stuffed olives on top of the sandwich for a nice presentation. Enjoy! Or as we say in Puerto Rico...Buen Provecho! In a gallon-size plastic bag or bowl add 3/4 cup water, 1/2 cup olive oil, 2 1/2 teaspoons of garlic powder, 1 teaspoon of black pepper, 1 teaspoon of salt, 2 tablespoons distilled white vinegar and the onion slices. Add in the meat and mix it all together, seal or cover, and marinate overnight in the refrigerator. In a heated heavy skillet, dump everything in and making sure that the steaks lay nice and flat in the skillet (don’t let them curl up), bring to a boil, turn steaks making sure that they are still laying flat and let them cook over low heat, covered for about 40 minutes or until meat is tender. Start layering this version of the Jibarito with a 4 inch portion of steak and onions (or cut the meat into strips if you prefer). Follow the directions in the chicken version above to complete the sandwich. Thanks again to Miriam Santiago for sharing this recipe. It's great! If you have any comments or questions, please send me an email at wayne@waynesweekend.com or follow me on Facebook or Twitter.